Tried, Tested and True is Giz and Psychgrad new event… run to their blog if you still don’t know them!!! 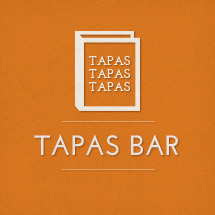 Great recipes and nice and funny stories are waiting for you at Equal Opportunity Kitchen :D.
Let’s go for Tapas! 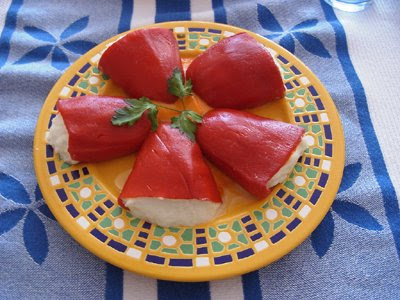 These wonderful Stuffed Piquillo Peppers is my entry for their event. A delicious recipe for a celebration day! Everything can get ready hours before so when you set the table you can join the party! Piquillo Peppers are originally from Navarra. They are normally roasted either with charcoal or gas. They should never get in touch with water while being roasted or they would loose their characteristic flavour. You can find them canned and ready to be stuffed! It’s a valuated tapa usually stuffed with codfish or crab meat. First.- go and buy a can of Piquillo Peppers! 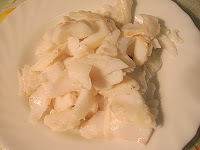 Second.- go and buy some salty codfish. Sixth.- serve and enjoy a new explosive fantastic flavour!!! 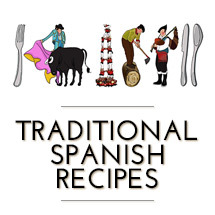 Ingredients: 17 Piquillo Peppers, 500 grs of codfish, 3 garlic cloves, 2 dl. of milk, 2 dl. of extra virgin olive oil, salt and black ground pepper. Once the cod is desalted, wash under tap water and dry it pressing the pieces with kitchen paper and letting all water go. Have a sauce pan ready with some water and high heat, place the codfish inside and have it boiling for 5 minutes, after that take away from heat, rinse the water and with your hands move apart the fish layers and discard the skin and bones. 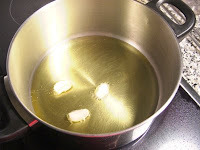 Take a pot with the olive oil and have it low heat, add the garlic cloves so that they aromatize the oil. Have it for 1/2 hour. Don’t let them fry. After that time, reserve the garlics. 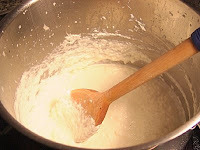 In another pot heat the milk. Take the codfish into a mortar and smash it until you get a paste. Now, take this paste inside a new recipient and add little by little the olive oil and the warm milk. Stir all the time until you get something similar to this. You might need the help of a food processor. Taste and add black ground pepper and salt to fit your taste. 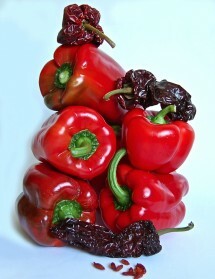 Now that you have the paste, take the 15 peppers outside the can and strain them and dry with some kitchen paper. Stuff them with the white cod paste. To get the sauce done: use 2 more piquillo peppers, cut in small pieces and place in a recipient, add from 1 to 3 garlic cloves (you had reserved) depending on how hot you want it. Use a food processor to mix and add some extra virgin olive oil until you get a fine texture. Present on a plate with the sauce in the bottom and the peppers on top. This tapa will be the first thing to disappear on your table. Just because the ingredients of this dish made me think of her, I would like to virtually offer this dish to my foodie friend Mallory from the Salty Cod. Tapas de Espana Nuria! Amazing. This sounds fantastic. I imagine the flavour of the cod to be mellow after mixing it with the milk. Definitely need to try. Cool! This is very different from anything I’ve ever tried. Thank you for the great submission to Tried, Tested and True! Stuffed pequillos are one of my favorite things to eat when in Spain. I have yet to find them easily here in brooklyn to try and make them! it’s so annoying. this looks SO delish, nuria! have a wonderful weekend. yum! mark bittman just did cod wrapped in blanched lettuce on nytimes.com — this reminds me a little bit of his dish! it looks delicious. Nuria, you know I’m partial to peppers and when you stuff them they are heightened to another level. The dish looks so vibrant with the white and red…another great entry for Tried & True. I want to join you and your friends around your tapas table. …a nice glass of Spanish wine, a little music…..
wooo hoooo! I got a virtually cooked dish dedication! Chouette! Merci beaucoup Nuria! c’est genial!! Hola Ben, you should try this one, either with crab or cod is just a delish! I’m sure it goes well with the mexican sabor!!!! He, he, you got the picture Val!!! I don’t think I’ve seen some of these ingredients but now I’ve written them down and off to market I go. I absolutely love love love this type of tapa and the only one I’ve seen similar is the Italian version. Your recipes always stimulate my creativity and you came through once again. Have a nice weekend you too!!! Giz you made me blush!!!! :D Thanks so much for your kind words, I feel flattered! Hope you find the ingredients in the market and you can have a spanish tapa!!! 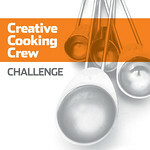 Hola Nuria, this is quite new to me and I think it sounds like a fantastic idea. I’ve yet to stuff peppers with fish! Hi Pixie! You will love the mixture! It goes so well together! Enjoy your Sunday, any more snow? I love piquillo peppers. They remind me of the vegetable version of squids. Your presentation is lovely too, Suavecita! This is really new to me but it sounds so interesting and we love cod so this is something which I hope to try soon. Wonderful! I’ve had piquillos stuffed with tna, but not cod. Must try your recipe!